In the 19th and early 20th centuries, the Mocanite, narrow gauge railways, trailed stunning mountainous areas to connect cities across Transylvania, Romania. The Mocanite, whose locomotives were steam-powered, were built for cargo and passenger services. The longest Mocanita at the time it was built ran for 123 km between Sibiu, Agnita and Sighisoara, crossing the Hartibaciu valley, an area unspoiled by industrialization, dotted with fortified Saxon churches and guarded by the snowy peaks of the tallest mountains in Romania. While successfully carrying out its transportation role in the first part of the 20th century, in 1965, the Sibiu-Sighisoara Mocanita faced a major setback. The Agnita-Sighisoara section was dismantled, because of its steep slopes and sharp curves, which made it difficult and expensive to operate, since the line’s average speed was 10 km/hour. In 2001, the Mocanita stopped working altogether, as the Agnita-Sibiu section was closed, due to lack of funding for locomotive maintainace. The abandoned railway was soon affected by thefts, while nature also started taking its toll. However, Mihai Blotor, who was in high-school in Agnita at the time that the Mocanita was living its final days, was convinced that the railway was the key towards sustainable development of Hartibaciu valley, which it traverses, as a potential tourist attraction. He believed that the Mocanita could bring in tourists and financial capital from Sibiu, an already established tourist attraction and European capital of culture in 2007, into the spectular valley. Apart from its world-class cultural treasures mentioned above, the Hartibaciu valley is also part of the Natura 2000 nature reserve, the second largest in the country after the Danube Delta, and boasts rare species of birds, animals and plants. While strongly believing in the Mocanita’s touristic potential, at first, Mihai felt too young and powerless to do anything. Nevertheless, he decided to take inventory of what remained of the railway. The mayor of Agnita eventually called him to help initiate a campaign aimed at restarting the railway or, at least, preserving what was left. In 2007, Mihai was contacted by several British citizens, most notably Bill Parker, a well-known steam locomotive restorer in the UK, who inculcated the railways preservation spirit in the young Romanian’s soul. So, in 2008, Mihai, alongside some of his friends, started doing minor work on the railway, mainly cutting down weeds to see if the tracks still existed. 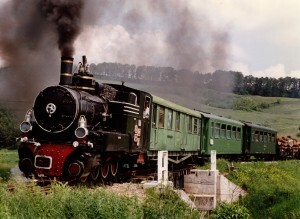 In 2009, they founded Prietenii Mocanitei nonprofit, aiming to preserve and restore the Sibiu-Agnita railway as a tourist attraction. Prietenii Mocanitei is also demonstrating to local and national Romanian decision-makers that a group of young volunteers is able to restore a railway, run trains, bring tourists and help develop entire abandoned communities, for which the government has chosen to bury any hope of revival. Mihai has managed to encourage over one hundred individuals to volunteer on the railway over the past six years. The volunteers look after the railway mainly during the weekends. On Saturday, most of the practical work takes place. On Sunday, tourist rides with self-made draisines, which are light auxiliary rail vehicles, are offered, as a fundraising activity. Looking back on his previous accomplishments, Mihai recalls that Prietenii Mocanitei’s first success was listing the railway and all of its buildings as a historical monument by the Romanian Ministry of Culture, “at a time when scrapping metal was a national sport and the railway’s existence was threatened by its own ownership – the national railway company.” They also managed to reduce the number of thefts and vandalism in the Agnita and Cornatel railway stations, restore the station building in another small town, Coves, and the water tower in Cornatel. Another remarkable success has been celebrating the railway’s centenary. Prietenii Mocanitei restored one of the surviving passenger coaches and two kilometers of track, while borrowing a steam locomotive to form a tourism train, the first to have run on the Mocanita in the last 9 years. Mihai’s biggest dream is to ensure that Mocanita can be revived and used as a tourist railway, with steam trains operating constantly. Another great aspiration is to rebuild the Agnita to Sighisoara section, dismantled in 1965. Mihai also aims to continue inspiring more young people to volunteer, in a country, where, during its 45 years of communism, volunteering became synonymous with forced labor. The young Romanian and his team are aware that in order to attain their highest aspirations, they have to take it one step at a time. So, on the short-term, Mihai and his team plan to start organizing the yearly ‘Days of Mocănița’ starting next September. This requires first upgrading the 7 km of track that are already been used for the draisine rides to allow a 30-ton steam locomotive to run, finishing one of the original passenger coaches’ restoration and borrowing a steam locomotive for the event. Mihai also hopes to eventually source their own diesel and steam locomotives, extend the length of the operational track up to 17 km toward Sibiu and run a daily service over the summer months. Mihai has received some support from local authorities alongside the railway, which have collaborated in obtaining a 25 year license over the railway. The county council, however, has never stepped in, while the central authorities in Romania’s capital city, Bucharest, have refused to engage the young volunteer group for years. As for the local communities, they are slow in showing their support, as they are still not confident that the train could ever be brought back.